Today I am thankful for rotisserie chicken. Rotisserie chicken is great for many reasons: it tastes good, it is moist (after all, who likes dry poultry? Not I), it is versatile (it can be cut up or shredded over salad, eaten by itself or as a part of a complete meal, eaten warm, or even eaten cold, just to name a few options), and it is fairly inexpensive to purchase if you opt to not make it yourself. Though I do enjoy cooking and I do not mind spending time preparing recipes that require a substantial investment of time, I do appreciate convenience when it is possible. 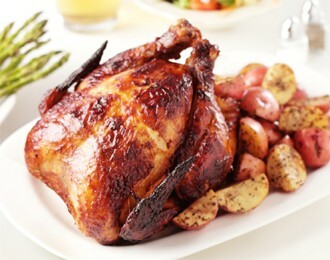 Rotisserie chicken is one of those food items that is a quick go to item for any meal, as having a sumptuous rotisserie chicken can be as simple as just stopping by your local grocery store, picking one out from the deli, paying for it, and then taking it home to enjoy. What could be more simple and quick than that when it comes to the actual preparation of food? Not mush else in my opinion.